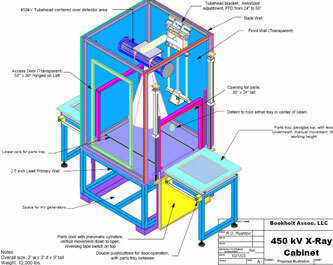 Radiation Rooms and Cabinets from Bookholt Associates X-ray and non-destructive testing equipment and supplies. Bookholt Associates are not just salesmen, but provide a complete range of services to support served NDT professionals in diverse industries throughout the northeast, including the expertise to design, install and survey radiation cabinets and rooms. Check our our used X-ray cabinets pages which can be some of the best values but also present the greatest risk. Bookholt and Associates are experts with the knowledge and contacts to connect you with the right piece of equipment at the right price-but also the expertise to evaluate and stand behind the equipment we sell. Doug Bookholt is on the list of certified physicists for industrial X-ray for the state of New Jersey.